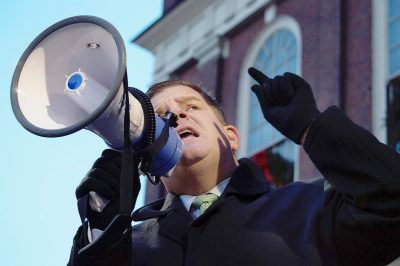 Boston Mayor Martin Walsh announced in a Jan. 16 press release that he would publicly challenge U.S. Education Secretary Betsy Devos’ proposed changes to the federal guidelines dictating a school’s response to claims of sexual assault misconduct and assault. These changes would reverse rules from former President Barack Obama’s administration by narrowing the definition of sexual harassment, limiting the scope of incidents a school is required to investigate and placing burden of proof on survivors, according to the release. Walsh was joined in his opposition by representatives from Emerson College, Suffolk University, Bunker Hill Community College and UMass Boston, according to the release. Boston University was not one of the institutions listed that joined the mayor’s effort. Boston City Councilor At-Large Annissa Essaibi-George wrote in an email that the rule overhaul would severely limit schools’ responsibility and hamper their ability to respond to sexual assault allegations presented by students. Katie Mitrano, the Boston-area director of student organizing for The Every Voice Coalition, a student-run organization that aims to fight sexual violence on campuses, wrote in an email that she questioned why the Trump Administration chose to limit the rights of alleged victims instead of setting further protections. Essaibi-George wrote that one of the most dangerous of DeVos’ proposed changes is one that would allow the accused party to cross-examine the accuser. Another of the rule changes would exempt educational institutions from investigating incidents that took place off-campus. Debra Robbin, executive director of Jane Doe Inc., a Boston-based coalition that fights against domestic violence and sexual misconduct, said that the changes could potentially expose victims to additional pain and suffering by only covering on-campus incidents. Amy Attwood-Charles, 34, of Brighton, said she thinks the proposed changes to Title IX will do more harm than good. Judith Muth, 54, of Back Bay, said she thinks the changes will allow for more fact-based information to determine if someone was sexually assaulted. Melissa Mackin, 25, of Jamaica Plain, said she thinks the proposed legislation will make it more difficult to convict people of sexual assault.